When I go to a nursery or garden center, what always draws me in is the sea of beautiful flowers, calling my name from the parking lot. Most of what we see from the pavement is the seductive beauty of annuals, plants that complete their entire life cycle during one growing season. So, they go from seed to plant to flower, and then to seed again and finally die, all in usually just a matter of months. The variety of annuals to choose from seems mind boggling, and more are coming on the market all the time. They are a great addition to the landscape, and provide that punch of color right where you need it with the tradeoff of a relatively short-lived display. Classic examples of annuals include pansies, petunias and marigolds. A comment I often get regarding annuals is that gardeners get tired of replacing them year after year. Today, there are more and more demands on our time than ever before. Trends indicate that many of us are seeking ways to spend less of it in the garden while still enjoying the benefit of a colorful landscape. The solution often given is to go with flowering perennials. In general, the flower of the plant is less dramatic and often blooms for only a week or two. However, these plants persist for more than one season and therefore perform longer in the garden. Well, to this I say it’s not an either-or decision. Go with both! Perennials are a good longer-term solution to many garden beds providing not only great color, but are often selected more for their foliage. Think Hosta and ferns. In fact, when in bloom perennial flower time can be short, lasting just a week or two. Think tulips or daffodils. One trick to getting more color from a perennial display is to arrange beds so that just as one perennial is completing its bloom cycle, another is beginning. For example, daffodils can be purchased as early, mid and late season bloomers. 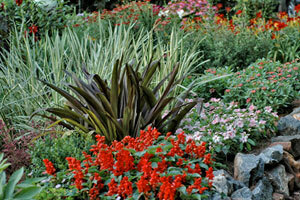 Planting all three types in a bed will provide an extended period of color from the flowers. To further illustrate a way to extend the display even longer, add daylilies to that same bed. Then, as the last late season daffodils have finished blooming and are in decline with their not so attractive foliage, the daylilies are there to fill in, literally. Color from the same bed now continues from early spring through late summer with a similar form. The best part is that the display continues the next year and for years to come with no additional work. Annuals on the other hand, can really punctuate a flowerbed or border in a way that perennials have yet to achieve. There is every color under the rainbow, and bloom times can last for months with the right care. So, next time you’re faced with which flower type is best for you, enjoy both. Each plays an important role in the garden and landscape.